You can see I am running out of jars now.. I have had to delve in the back of the cupboard to find enough for this recipe... more are on order already so I am hoping for delivery soon, very soon! 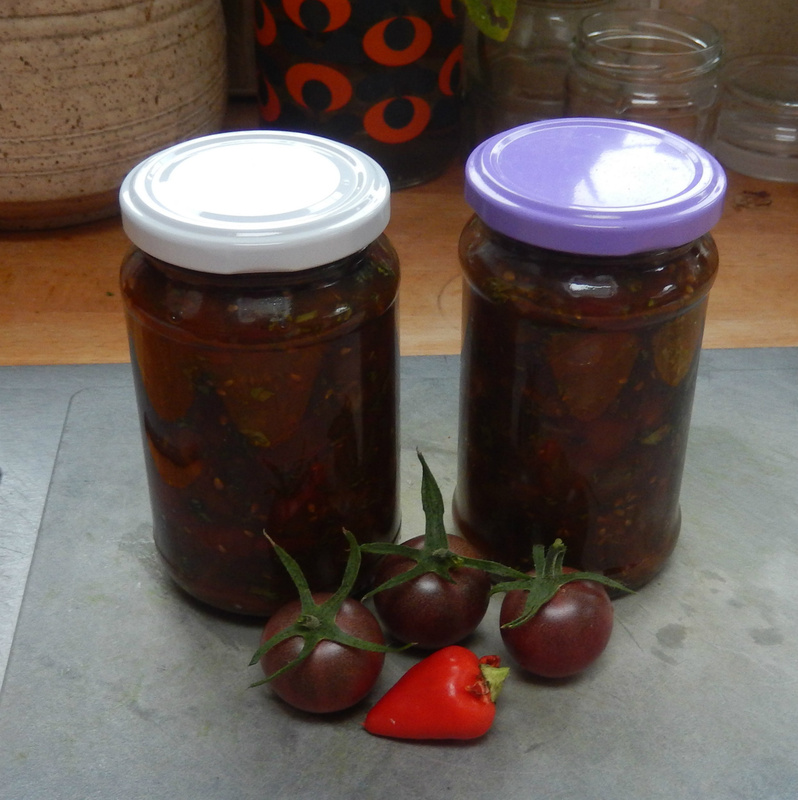 I have never made TomatoJam before, so thought I'd give it a go, as we do have a bountiful tomato harvest this year. I had the idea that I could use all the orange and yellow tomatoes, and this would make a gorgeous golden-coloured jam. I also wanted to make it quite spicy and distinctive, so added chilli powder and smoked paprika... the jam turned our darker than I had imagined by a long way. It does taste good though, so I am sharing the recipe, for those of you who enjoy things with a bit of a bite. You could always leave out the chilli if thats not for you, and still have a pretty good jam. - water bath correctly. My pan is not deep enough to immerse the jars completely, but having only the top inch sticking out seems to still do the job. 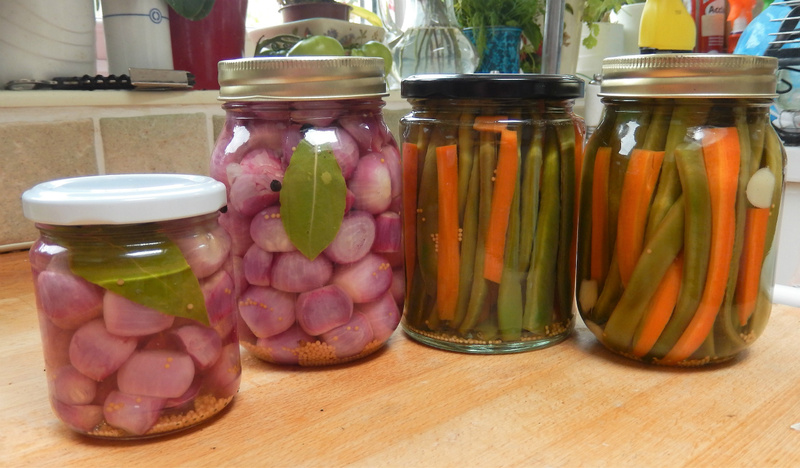 Obviously I recommend full immersion, a case of "Do what I say, not what I do", but so far we have escaped botulism. The pop-down lids do indeed pop down and other seal well, so I am content that they are fine. 10. Get the water bath ready (I use the same pan, washed, as I only have one really large one). Put a folded teatowel in the bottom of the panso that the glass jars are not in direct contact with the metal of the pan. 15. When the jars are cold, add labels... you might think you will remember what they are, but will you, in several months' time??? And that is it. You can make all sorts of tomato-based sauces in the same way. This week's was another curry-base, starting with frying onions and garlic with spices, before adding the other ingredients (except the basil) and I shall be doing another today, loaded with coriander leaves and ginger. They'll keep us going for months! 3. Pour the liquid into a clean pan and add the sugar and spices. 4. Simmer until a fairly thick, but not as thick as jam. This keeps for at least six months in a cool, dark place, unopened. Our last batch was fine after a year tbh. Once the jar has been opened, it is best to store in the fridge. Faced with the large pile of green tomatoes saved from the plants affected by Late Blight, I decided to have another go at a chutney. 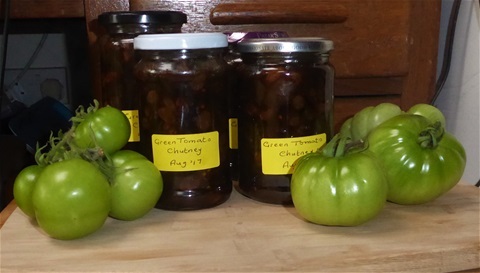 Green tomato has never been one of my favourites, so I thought I'd add lots of things I do like and hope that it ends up tasting good and perhaps a little bit Christmassy. Well, it tastes just fine, complementing mature cheddar rather nicely, so it is safe to share the recipe!! Don't be put off by the long list of spices: anything you do not like can be omitted and anything that is your favourite you can increase, or indeed add, My advice would be make a half size batch if you are unsure and then chnage it if not to your taste. Only fennel comes through in this mix as a "top note" though, which we like a lot. The others blend well and do not dominate. 4. Boil until dragging a spoon along the bottom of the pan leaves a channel which does not immediately flood with liquid. Mine boiled for 38 minuts, but this is dependent on how juicy the tomatoes are. Do not overboil though as your chutney wil be very thick and hard to get out o the jar when it has cooled. Unopened, this will keep for a year in a cool, dark place, and once opened, will be fine in the kitchen cupboard... it won't be there long!! Blackberries are ripening early this year, and having a large bowlful rather took me by surprise. 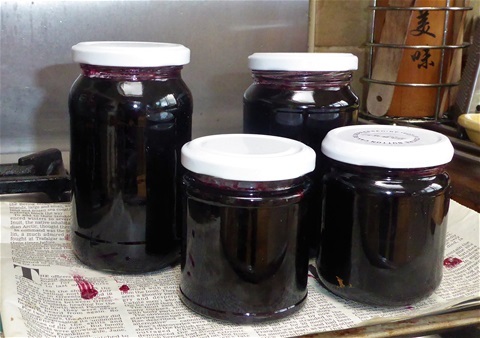 I remembered that last year I attempted this jelly and it didn't set too well, so as blackberries picked at the start of the season seem to have more pectin in them, I thought I'd give it another go. It is very good as a condiment with roast meats, especially chicken, and adds a depth of flavour to meat sauces or gravies. My friend Lesley said it would be good on toast too, so I guess she liked it. And there you are, a lovely batch of Bramble & Rosemary Jelly. 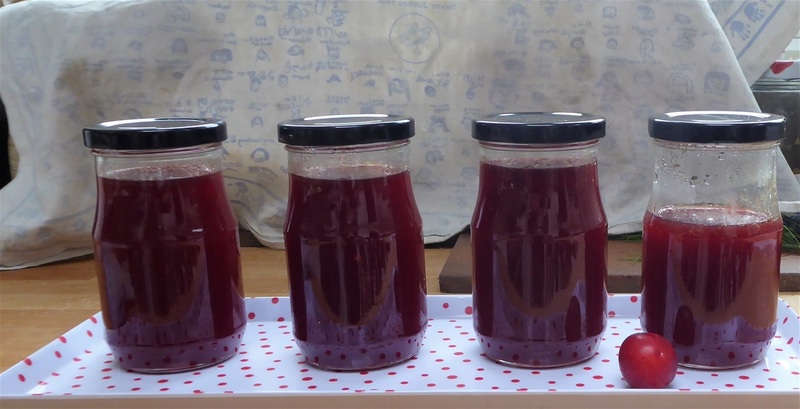 My litre of juice made 2 x1lb jars and 2 x ½lb jars, with a tablespoonful left over for tasters. We made this in some haste as I had forgotten we had entered the Marmalade Class in the local Show. It is absolutely delicious, as well as being super speedy. It was awarded a First, so we are not the only ones who like it! This quantity made about two one-pound jars' worth, which is a half jar more than in the photo. The other one went straight into the kitchen cupboard to use on our breakfast toast. It would be easy to double up the recipe but remember the setting point boiling time will be slightly longer with the larger volume. 1. Put the grapefruit in a large pan of cold water so that they float freely, bring to the boil and boil gently for two hours. You might need to top up the hot water so keep an eye on it. You can sterilise your jars and lids in this time. 3. Pour the water away. Slice the grapefruit as finely as you can right through. Remove any pips and chop the flesh a bit. Put into the preserving pan. Put a small plate in the freezer to use when you test for setting point later. 4. Add the sugar and lemon juice. You can use white granulated, or part jam sugar. It does affect how quickly the marmalade reaches setting point - there is enough pectin without jam sugar, provided by the membrane of the grapefruit plus the lemon, but I was in a hurry! 5. Bring to the boil, stirring to dissolve the sugar. Any remaining pips will float to the surface so are easily removed. 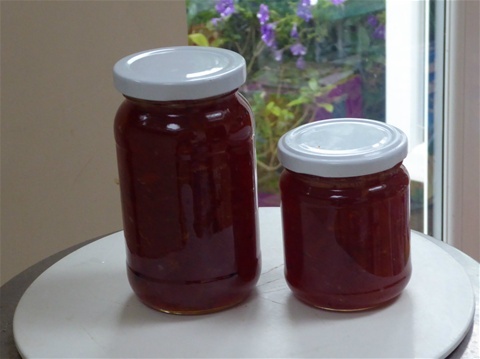 If you have used half jam sugar, the marmalade will reach setting point very quickly so boil for six or seven minutes and then test with some on the plate from the freezer... wrinkling of the surface means it is ready. Mine took only eight minutes, so be careful not to overcook or burn it. And that's that! Amazingly quick, no need to make masses of it and cutting the grapefruit is very easy. I shall have a go with tangerines when they are in season: they will not need a two hour boil though. 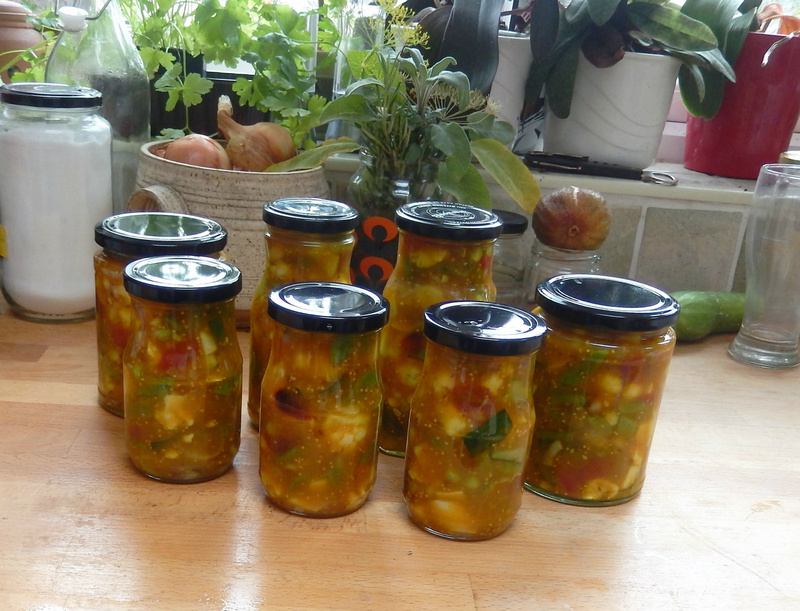 I like piccalilli, but never seem to get around to making any, so this year I have made a concerted effort to get some in the jars with enough time for it to mature before the festive season arrives. I had to buy a cauliflower for this, as we haven't grown any. This recipe is Pam the Jam's from River Cottage, exactly as she gave it, so many thanks, Pam! I made 2kg as I want some for presents and plenty to share at home too. I now know that this was not the brightest of things to do: I had to rinse the vegetables in two batches after salting as there was too great a volume to move them about in the largest bowl I have. I used 2kg in total of: cauliflower, runner beans, pattypan squash, batons of cucumber, small tomatoes cut in half including some green cherry ones, shallots sliced into 25cm rings and whole nasturtium pods. 1.Place in a large bowl and sprinkle with the salt. Mix well, cover the bowl with a tea towel and leave in a cool place for 24 hours, then rinse the veg with ice-cold water and drain thoroughly. 2.Blend the cornflour, turmeric, mustard powder, mustard seeds, cumin and coriander to a smooth paste with a little of the vinegar. Put the rest of the vinegar into a saucepan with the sugar and honey and bring to the boil. 3.Pour a little of the hot vinegar over the blended spice paste, stir well and return to the pan. Bring gently to the boil. Boil for 3–4 minutes to allow the spices to release their flavours into the thickening sauce. 4. Remove the pan from the heat and carefully fold the well-drained vegetables into the hot, spicy sauce. 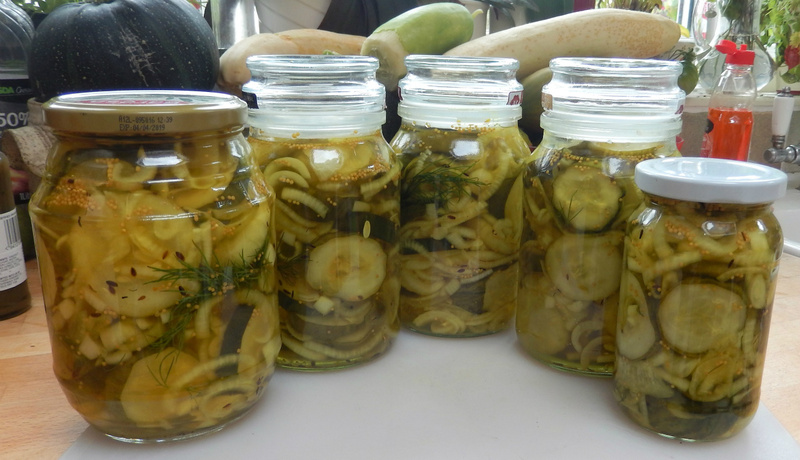 Pack the pickle into warm, sterilised jars and seal immediately with vinegar-proof lids. Leave (if you can) for 4–6 weeks before opening. Use within a year. And I found out the hard way that it is much easier to spoon the completed pickle into wide-mouthed jars.Choose your jars accordingly! I am keeping all the preserves recipes together as I use them a lot and want to be able to find them easily! 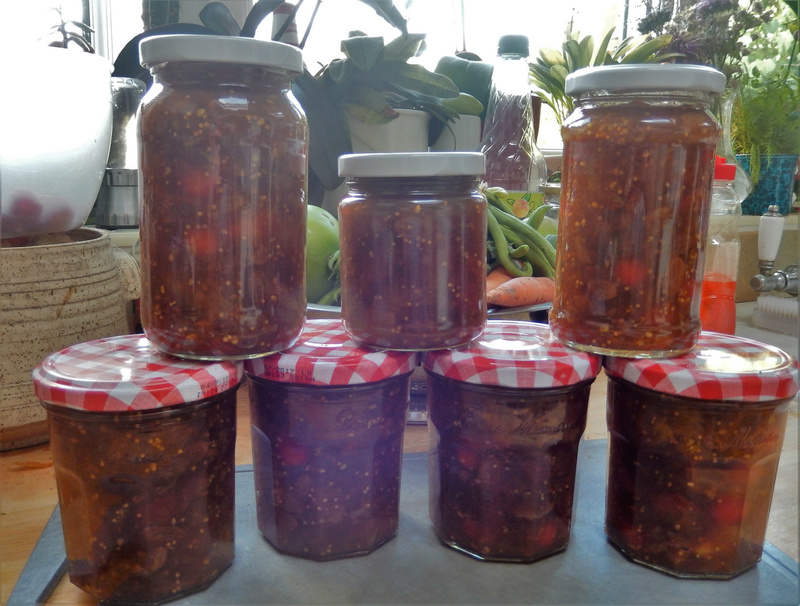 Buoyed up with the success of the yellow tomato jam, I decided to tackle the ever increasing weight of our chocolate cherry tomato harvest with a chutney. Abi had commented that the yellow one was a bit sweet for him, and maybe I could make something a bit spicier. So this is it, and spicy it is indeed. Using fresh basil in the jam had worked well, so I wondered how fresh coriander would fare. It could take double the amount if you want more than a kind of under current of flavour. The chocolate cherries resulted in a beautiful rich dark colour. Overall, OK for a first attempt though and it met with Abi's approval, which is no bad thing. It'll be staying "on the list"! This amount filled three 500g jars. 1. Prep your jars and lids! 5. Allow to cool for five minutes, stir again to evenly distribute the coriander, and pour into jars, removing any air bubbles with a bamboo skewer. Put on the lids straight way. Now I am writing this, I realise I left the star anise in, so one jar will have a whole one inside! Never mind, I daresay it'll come to light before anyone eats it. At least I hope so! zest of two lemons - You can omit this if you don't like lemon, or add more if it is something you enjoy. You do need the juice however, as it helps the jam to set. 2. During this time you can prep your jars and also put a small plate in the freezer to use for checking the setting point. 5. Take off the heat completely, stir in the lemon zest and basil. Leave for five minutes, then stir again. 6. Pour into jars and put on lids while still hot. I would assume this keeps well, as any other jam would, but once it is opened keep in the fridge just in case! It is the first time I have made this, so I'll let you know next year how it lasted, if we have enough left to test it. What I can say though is that is goes very well with strong cheese, is delicious spread over cheese on toast and in cold meat sandwiches. I also plan to use it as a glaze on barbecued chicken, warmed and painted on towards the end of cooking. If you like mango chutney, then this might appeal to you. It is sweet, yes, but you can make it as hot as you like with the chilli. I used two Albertos Locatos (without the seeds -- they are large and an unappealing dark colour) but you can use any red chillies you like the taste of, in whatever quantity suits you. You can also vary the spices: crushed methi seeds (fenugreek) are a very good addition, and my second batch will certainly be includng these. It is also incredibly quick to make, which when I am dealing with a kitchenful of produce several times a week, is a real bonus! The nectarines are not home grown, but were in the reduced section in our local supermarket. At 40p for nine, it seemed silly not to buy them at that price, to widen our preserves bank. 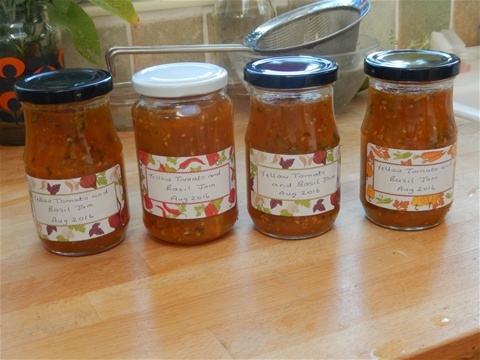 Luckily there were more on my following visit, as the first batch of chutney is almost gone already! I first made this three or four years ago to use up a large number of cherry tomatoes which I didn't want to skin as this can be fiddly. Since then it makes an annual appearance, in several variations, some with green fennel seeds, some with cumin and coriander and some just plain tomato, plus anything else that comes to mind while I am cooking up a batch. I can almost make it on automatic pilot now, whch gives plenty of space in my head for thinking at the same time, unlike totally experimental things that need my full attention. 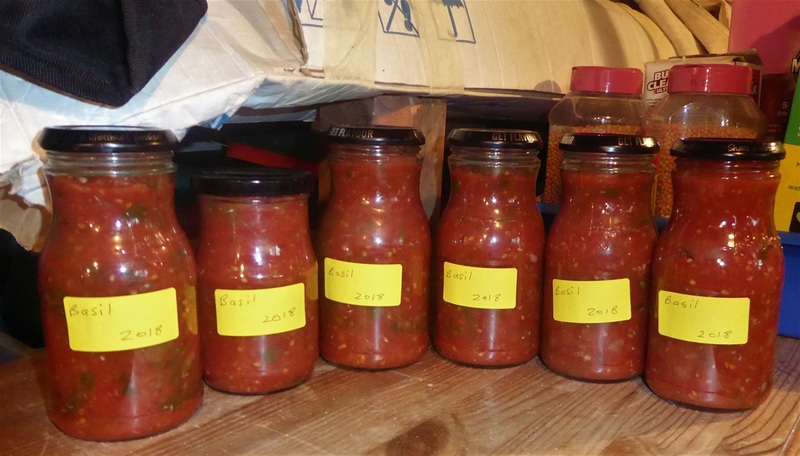 I have given you amounts for a relatively small volume, as not everyone grows tomatoes in huge quantities, and it is easier to mulitply up rather than scale down I reckon.l This makes around 3lb so choose your jars accordingly, sterilise these and keep them warm. Don't forget the lids need to be vinegar-proof. 1. Chop the onion and red chilli(es) if using. I use a food processor and blitz them both together. 4. After 30 minutes add the halved tomatoes and bring back to the boil. Simmer again for around 25-30 minutes until thickened. There should be no vinegar visible that is not incorporated into the mixture. If there is. cook for a few minutes more, stirring to make sure the chutney does not stick to the bottom of the pan. 6. Using a funnel, fill the jars to within ½ cm of the top, and with a wooden skewer, wiggle out any air bubbles, then wipe the edges of the jars clean and put on the lids. This will keep for at least a year (even two, I found out last week -- one appeared from the back of the cupboard) somewhere cool and dark. This is a very versatile recipe, as you can use up some green tomatoes too as part of the weight, if you have any at the end of the season. Just chop them and add them at the same time as the onion. There is no need to skin them. This is a tasty addition to salads, especially in the Winter when there may not be much on the plot to eat fresh, as it gives a decent crunch as well as tasting good. It can also accompany cold meats or cheese with crackers. Last year I made a version with French Beans, flavoured with lemon & rosemary, which was surprisingly good but I thought I would ring the changes this year, and just for once we have some decent carrots! 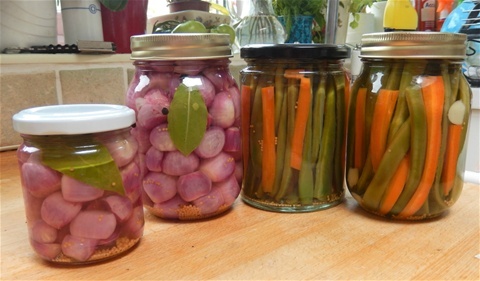 Enough vegetables to fill two 500g kilner style jars, trimmed to fit in vertically as in the photo here, with the carrot batons a similar thickness to the beans. Blanch these, two minutes for the beans, three for the carrots, cool under running water and dry them. 4. Remove the bay leaves and pour the vinegar carefully into the jars. Store in a cool dark place for three or four weeks before eating: it will last for at least a year unopened however. 2. After an hour the water will be cool, so take out the shallots one at a time and peel them. Doing this helps the skins come off easily and reduces their eyewatering tendency too! 6. Rinse and dry the shallots, then pack them tightly into the jars so that they will not float in the vinegar but stay submerged. Indian-style chutney tends to be fresh and eaten the same day, whereas here in England, making chutney is a way of preserving some of Summer's bounty to eat later in the year, especially when there is a glut of bounteousness!The original recipe came from Val Harrison, and I have hardly changed it... if it ain't broke, don't fix it ... so thank you Val! This year we have had a good crop of aubergines, but some years it is dismal. 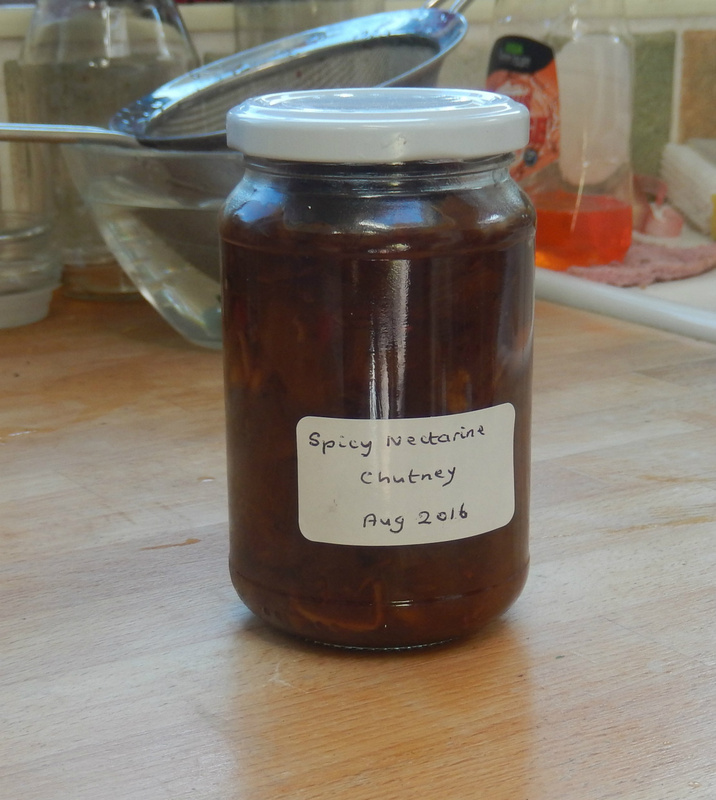 In this case, I buy a large bag of aubergines for £1 at our local greengrocer shop, which makes this chutney quite economical still. 3 tablespoons salt - I used kosher, just in case! 1.Slice the aubergines, put into a colander and sprinkle with the salt. Leave for at least three hours over a bowl to catch the juice, then rinse and dry. 5. Pour into hot sterilized jars and seal. Use lids that are vinegar proof! This can be eaten straight away but does taste quite vinegary. If you leave it for a couple of months I think it is much nicer. We eat it as a condiment with rice dishes, or as a spread in cheese sandwiches. This is not made of bread and butter, nor made to eat with bread and butter either (unless you want to) but is so called because in the Southern States of the USA folk made it out of the ingredients they could grow, and traded it for goods they needed ie it was their "bread & butter". However it got its name, the pickles help preserve a glut of cucumbers in a delicious and long lasting way, and is very easy to make. You must however, use salt without any anti-caking agent in it and the best I have found is Kosher salt, which is readily available on-line (with next day delivery even!) Using table salt gives the cucumbers a greyish colour which is quite unappetising. I learned this the hard way last year, so please do share my learning if you want your pickles to look nice and green. I like recipes that use cup measures as is saves getting out the scales. As long as you use the same cup each time it keeps the proportions the same, so it does not need to be a special measuring cup. I have an old mug which has lost is handle but I like the picture on it so didn't want to throw it away: does the job. This quantity fills five 500ml kilner style jars. As you can see from the photo I have used a range of jars I had to hand, which have plasticised insides to the lids, which prevents vinegar corrosion of any metal. 6lb of cucumbers. I used normal long cucumbers, but gherkins are fine, or snacking cues. If the skins are very tough, peel them off. 2. Thinly slice the onions as huge thick pieces are a bit strong. It is a lot of onions to slice, so remember to breathe through your mouth and don't rub your eyes! 3. Put the cucumbers and onion in a very large bowl (I used my large preserving pan, which is teflon lined --aluminium is not OK), mix them carefully together and sprinkle the salt over them. 4. Put a layer of ice cubes over the top of the mixture and leave overnight, topping up the ice cubes before bed, if you can. Cover the bowl with a lid to stop your house smelling of raw onion! 10. Now fill the jars to within an inch of the top. If possible, get some of the slices to face outwards against the jar sides, bu this is only important for presentation, not flavour! 11. As you fill, push two springs of dill down the insides of each jar. 12. Check to make sure there are no airbubbles trapped in the vinegar. If there are any, poke a sterilised wooden chopstick or skewer down to dislodge them. 13. Top up the jars now to within 1 cm of the top (The push-on lid coffee jars I used need more space left than this to enable the lids to go on properly) and screw on the lids. 15 Leave in a cool dark place for 3 -4 weeks before eating. They keep unopened for at least a year, ut once they are open, keep them in the fridge.